Every day my kids bring a snack to school. From wheat thins to popcorn, the snack can vary, but the bag is the same. The plain, boring snack bag doesn't usually bring a smile to a child's face. It's time to make snack time fun with Wexy Bags. 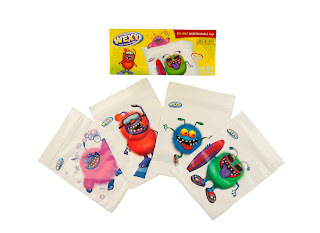 WEXY bags are eco-friendly snack bags. They are biodegradable, BPA Free, recyclable, and reusable. These bags are made in the USA. These bags are small in size yet very durable. I wouldn't over-stuff, but you can serve a decent size snack in these bags. While parents are happy with the all the specificiations, kids are excited about the four funky monsters. What child wouldn't want to see a funny, silly monster staring at him at snack time. My kids have names for these monsters. They are sporty, beachy, bubbles and fishy. I was told that these nicknames represent the monsters activities. Sometimes my kids are so excited to see the fun bags that they don't complain about eating the fruit, veggies or other healthy options. For more information on Wexy and it's products, please visit this website. Bring a big smile to your kids' faces with Wexy snack bags.